Friendly K9 Rescue is a Non-Profit Organisation dedicated to providing temporary care for dogs in need and finding them suitable homes. We are a Not for Profit, Registered Charity. We will contact you within 48 hours via email or phone to discuss the pup/dog and arrange a suitable time for the family to meet the animal. 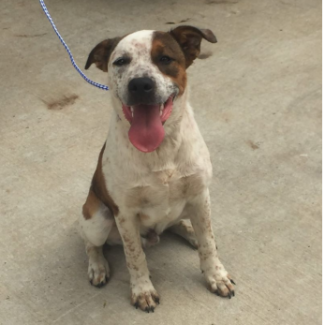 Shaun 1 yr male cattle dog x He has spent 3 months in the pound yet he has such good manners, also in the kitchen. If you are after a companion animal, someone who will love you no matter what, a boy that will heel that close he will break your thongs, a man about the house that will listen, a friend to curl up on the lounge with, a partner to encourage exercise - then Shaun may be your perfect match. I believe if you work, Shaun would benefit from a K9 friend. Also Shaun was not taught not to mouth or deflea humans...for this reason, I won’t place Shaun with young children.